Freelancing as a designer or developer can be a freeing experience and with more freelance job sites popping up online, now is a great time to jump on it. Being a freelancer gives you the opportunity to create and design at times that suit you, work from wherever you are, choose the jobs you are really interested in and have levels of flexibility most other folks only dream about. Basically anyone with anything to sell needs to either learn how to do it, or … more often, turn to someone who can do it for them. Which is where you come in! Below is a collection of the best freelance job sites for you to sign up to and start earning income as you build up your skills. So without further ado, here are my favourite sites not only for finding freelancers to do tasks I need – but sites I can happily recommend to you as great sites to kickstart your own freelancing career and get some cash flow while you increase your skills at the same time. The first place to go to when trying to find good freelance job sites has to be Fiverr. It’s a great place to start your freelancing work to just see if this is something you are interested in. You can charge from $5 – with the option to charge more too, but if you are just beginning and are using freelancing to expand and develop your skills, then start low and use it as paid experience. This works a bit differently than other design sites with a more ‘crowdsourcing’ angle. The client posts their requests and how much they are willing to pay and then designers create entries to be considered – if they are choose yours, you win the prize. This can be a little riskier, ’cause there’s no guarantee you’ll get paid for your work but it’s an excellent place to test out your skills, develop some items for your portfolio and get feedback… and if you DO win, you’ll end up with more than you would normally be paid for a regular freelance job. One of the original freelance job sites has to be Upwork. This site has been around forever… it used to be called odesk and gives you the opportunity to try your skills out at a hugely varied array of projects. This is one of the oldest and largest freelancing sites online, so you’ll have no issue finding clients here, just sign up to become a freelancer and search to find jobs that appeal to you… and get applying! This is an excellent alternative to sell services like advertising graphics, business card design, logo design, banners, ecovers and even website design. If brand identity, website design or app development (including UI design) is your thing then Crew is worth joining up to and listing your portfolio. Guru is a good spot for most kinds of freelancing (not just design, but development, writing etc) and has the extra benefit of offering the ability to keep funds in escrow, so you have a better chance of getting paid after you finish your work. Behance offers a really clean way to manage your clients and jobs, so you can find jobs in Behance and service your clients in a nice streamlined way. Companies like Salesforce & Microsoft as well as smaller startup companies use Dribbble to find people to do tasks – so, why not let that be you! You can get a free account, and then click the ‘Hire Me’ button and get started. 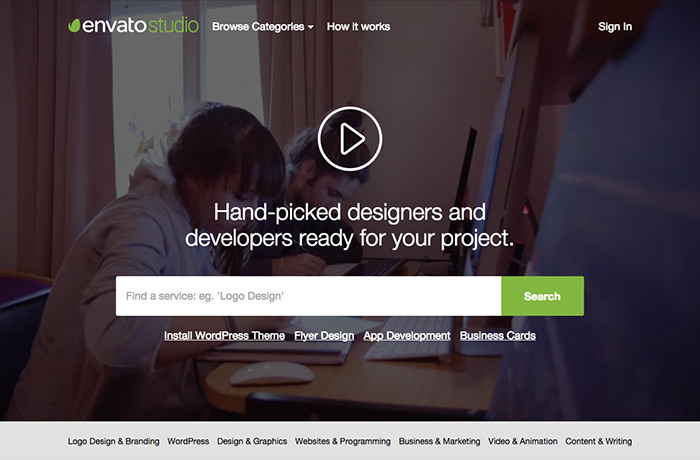 Envato is an Australian based (but 100% massively global) marketplace for anyone from designers, to coders or video creators and more. You can create templates for logos or banners or anything that is your specialty – and then sell them multiple times, so you aren’t working for a ‘client’ as such, but making and selling your designs over and over. Fiverr is good to find people to hire. I haven’t tried these other places and don’t want to do work for $5.